1. Slice the cucumber lengthways into thin ribbons using a vegetable peeler. When you get to the seeds in the middle, turn the cucumber and slice from the other side. Discard the seeds. 2. Arrange the cucumber strips loosely on a large serving platter. 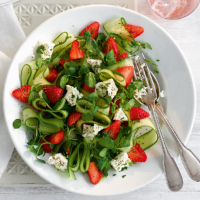 Scatter over the strawberries and watercress leaves, then crumble big pieces of feta over the top. 3. Whisk together the lemon juice and olive oil and drizzle over the salad. Finish by sprinkling over the mint and adding a good grinding of coarse black pepper. You shouldn’t need extra salt due to the saltiness of the feta.